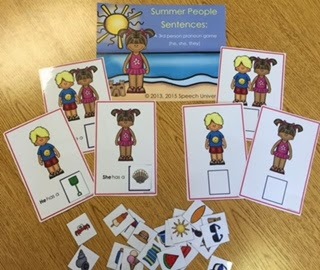 I love using my free product called Spring People Sentences. It was one of my first free products, and something I actually use all of the time (during the season). Last week, I was using it, and realized that I had some great new spring clip art that I would love to see used on the mats. Well, this turned into me completely revamping the product! 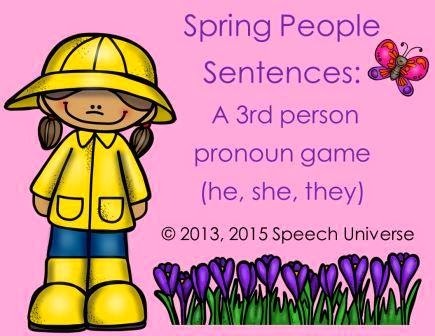 This is a free product that targets third person pronouns in a really simple way. There are mats with sentence starters, and mats that are blank. Both sets contain a boy, a girl, and a pair (they). The mats with sentence starters simply state: He/She/They have a ______. There are 24 different items for the student to comment about. 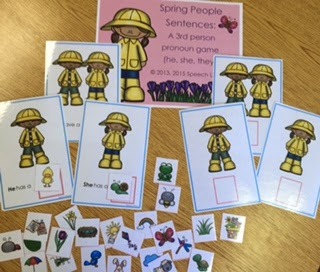 This activity targets not only the pronouns of he, she, and they, but can also target a variety of spring vocabulary. My students love picking a picture to use in their sentences! So, while I was revamping my spring pronoun packet, I decided to redo my Summer People Sentences also. This has never been available on TpT. I released it as a freebie on my Facebook page for a year, and then had to remove my freebie link from Facebook. So, this may be new to many of you. Even for those of you who have my previous version, I think you will be pleasantly surprised with the changes. The layout of these mats are exactly the same as the spring version, just with summer vocabulary.